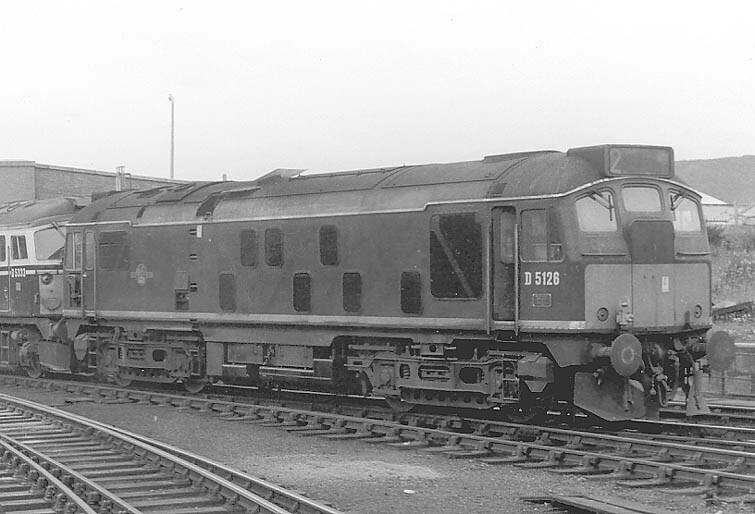 The sixteen year seven month career of D5126/24126 was spent allocated only to Scottish Region depots. After withdrawal 24126 was stored at Millerhill (?) until moved to Doncaster depot during May 1976, remaining there until about December 1976 when it was moved to Doncaster Works and broken up by August 1977. Photograph collection of webmaster. Its the end of the line for 24126, seen here at Doncaster depot, prior to transfer across to the Works for breaking. The locomotive sports the beefed up headcode panel, no doubt to deal with the more severe winters found in the highlands of Scotland. Photograph courtesy Mike MacDonald. Its August 1963 and the Class 24s have been at Inverness for about three years, 5126 has changed a little since delivery from Derby. A yellow warning panel with rounded upper corners has been added. At the other end the tablet catcher equipment is just visible. Condition April: green livery with small yellow warning panels, curved upper corners, warning panel covers frame level stripe, gangway doors and headcode box glazing without weatherproofing enhancements, shortened fuel & water tanks, boiler room grilles fitted, hand/footholds present, cantrail water filler present, three-rung bogie mounted footsteps, ridge sided sandboxes. three piece miniature snowploughs fitted, tablet catcher fitted, engine exhaust in original location. Photograph courtesy J Ashley, collection of webmaster. 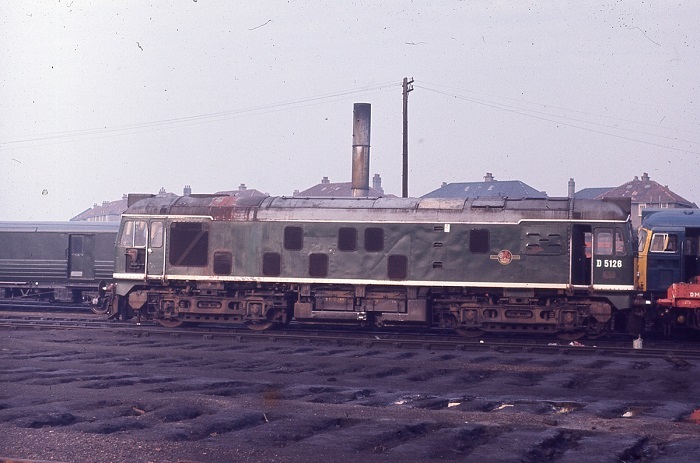 D5126 in green livery with a heavily work-stained grey roof at Eastfield depot, date unknown. The WCML was blocked on October 6th after Class 47 No.1836 ran away with its train at Wamphray and collided with a preceding freight, the locomotive amongst other things was seriously damaged. 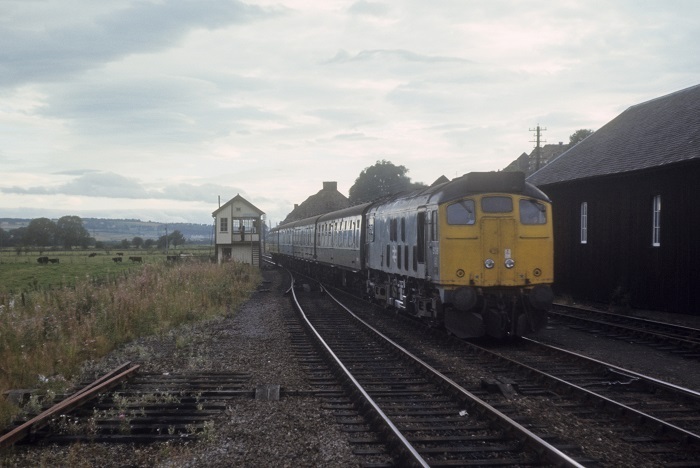 Diversions saw the Carlisle - Millerhill freights run via Newcastle, amongst the local machines recorded were Inverness based ‘foreigners’ 5126 and 5119. Photograph courtesy Bernard Mills. 5126 northbound at Dingwall on September 18th 1971. The train is crossing with the southbound Wirral Railway Circle 'Hebridean Express' powered by 5125 & 5129 and returning from Kyle of Lochalsh. On April 28th 5126 & 5130 worked the The Wirral Railway Circle's 'Hebridean Express' from Inverness to Kyle. Condition April: blue/yellow livery, gangway doors fitted with substantial weatherproofing, steam style shed plate on cab front, headlights fitted, shortened fuel & water tanks, solid blanking plates fitted (five slats), hand/footholds plated over, cantrail water filler sheeted over, three-rung bogie mounted footsteps, ridge sided sandboxes. three piece miniature snowploughs fitted, two engine exhaust ports (circular - original and rectangular - above engine room). The regular use of the Class 24s out of Inverness came to an end in October with their transfer to Haymarket in exchange for Class 26s. 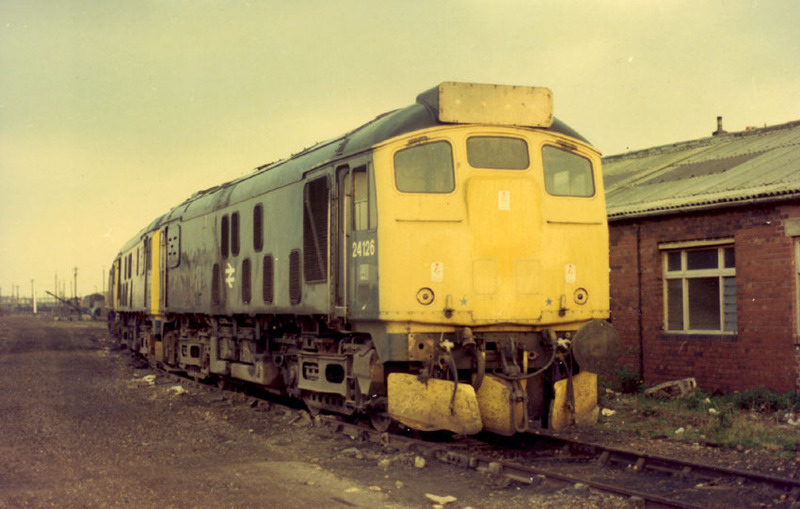 For most of these Class 24s this was their first re-allocation since delivery, they also had the headlights removed at this time. 24126 was withdrawn on February 2nd 1976, as was sister locomotive 24127. Condition final: blue/yellow livery, gangway doors removed, headlight location sheeted over with square plates, shortened fuel & water tanks, fuel tank has circular gauge, solid blanking plates fitted (five slats), hand/footholds plated over, cantrail water sheeted over, three-rung bogie mounted footsteps, ridge sided sandboxes. three piece miniature snowploughs fitted, vertically hinged battery isolating switch cover. Last updated April 3rd 2019.